Self Healing to be used at Home! The name ‘MIR’ stands for Mental and Intuitive Reset. 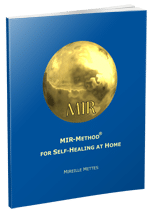 The MIR-Method is a unique self healing method, which is a gift from Mireille Mettes to every single person in the world. It is meant for people with emotional and/or physical complaints who would like to do something about it by themselves. This is because the method activates the self-healing powers of your body. What you need to do to accomplish this, can be done in the comfort of your own home and all by yourself. You do not need any tools and you do not need to buy anything. It is very simple and very effective. Doing the MIR-Method takes only 2x 2 minutes a day. All you need to do is to repeat it for at least 4 weeks. To support you, you can subscribe to the 6 weeks guidance emails and my newsletter! You will receive the first 3 chapters of the MIR-Method Handbook for FREE! Often people find some relief in the first weeks. For the total explanation of the MIR-Method watch the extended instruction video. The MIR-Method was developed in 2009 by holistic therapist Mireille Mettes from The Netherlands, Europe. You can pass it on freely to family, friends, colleagues and acquaintances. Many therapists use the MIR-Method in their practice as a support for their patients. The MIR-Method is never a replacement of medical or psychiatric help. Always use your common sense and maintain contact with your doctor or specialist. Keep taking your medication, as long as your doctor or specialist thinks it is necessary. To learn the entire MIR-Method, click on ‘Video‘ and you will be directed to the instruction video. If you then still want to learn more, you can look at the frequently asked questions or buy the MIR-Method Handbook or MIR-Method CD. To help spread the MIR-Method you can also buy MIR-Method instruction cards. When you buy something you support the work of the MIR-Method. Thank you. Step 2. Detox all toxicity. Step 3. Detach father. Detach mother. Step 5. Supplement all shortages. Step 6. Balance hormone system. Step 7. Fulfill basic needs. Step 8. Optimize Chakras and Aura.